A hat-trick of assists from Man of the Matchday Kai Havertz, a match-winner from Marcel Sabitzer and a clean sheet for Jiri Pavlenka, who simply did not want to be beaten. 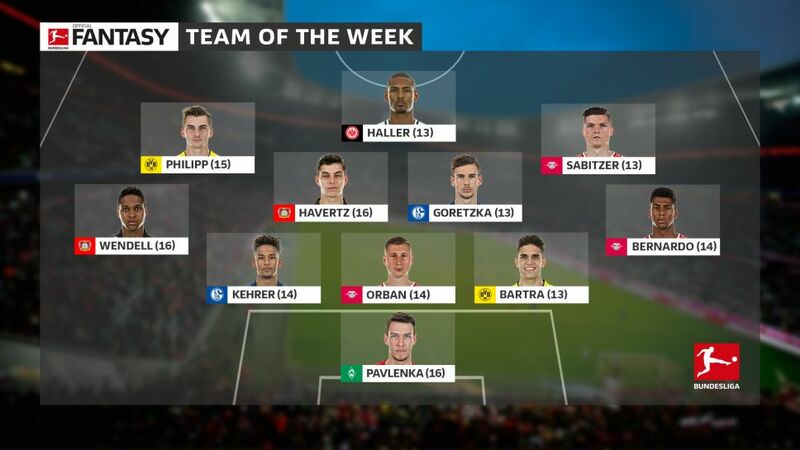 All are heroes for their teams and have rightfully found their way into the bundesliga.com Team of the Week for Matchday 9! How did your team perform? Click here for the Official Fantasy Bundesliga standings! The Czech shot-stopper was a man on a mission at the RheinEnergieSTADION on Sunday. Faced with a barrage of attacks from a Cologne side in desperate need of a first win of the season, Pavlenka made a mammoth nine saves to ensure his Werder side a point against the only side below them in the table and maintain the three-point gap over the Billy Goats. An immovable force in the Leipzig defence that has now won four on the bounce, the Brazilian won a whopping 19 challenges – the most on the pitch – to keep the Stuttgart fightback at bay in the Bulls’ narrow 1-0 win – a result that moved last season’s runners-up to within just a point of joint-leaders Borussia Dortmund and Bayern Munich. Starting the game against Eintracht Frankfurt in the unfamiliar right-back position for the first time in the Bundesliga, the Spain international excelled both in attack and defence. He set up Nuri Sahin for the opener before setting to work keeping the Eagles at arm’s length by winning 15 of his challenges against the physical Frankfurt. Like his defensive partner Bernardo, the Leipzig captain was just as immovable in the back line against Stuttgart. The 24-year-old centre-back also won a monumental 19 challenges to hold off the turbo-charged Stuttgart attacks that followed the home side’s goal. Thanks to Orban, the only goal of the game secured the hosts all three points. The 21-year old German has blossomed under new Royal Blues' boss Domenico Tedesco, playing every minute of every game this season. He rewarded his boss’ faith with a stand-out defensive performance against Mainz, winning 15 challenges to limit the Zero-fivers to just that - zero-five attempts on goal in a dominant win to secure back-to-back 2-0 victories for Schalke. Fulfilling both his attacking and defensive duties down the Leverkusen left, the Brazilian’s 69 touches of the ball was more than any of his teammates. He provided an assist for Kevin Volland’s goal to make it 4-1 as well as setting up a number of other attempts. Doing his day job at the back, the left-back won a strong 18 challenges to nullify a potent Borussia Mönchengladbach attack. Leipzig are the only team to have won their last four in a row, and they have Marcel Sabitzer to thank for the last two. After scoring in the 3-2 win at Dortmund on Matchday 8, he struck again to earn the Red Bulls all three points against Stuttgart, showing he is more than just a midfield battler. Another midfielder with a sharp eye for goal is Schalke's Leon Goretzka, who continued his current purple patch with a third goal in as many games, and his fourth of the season. Given he scored one also while on international duty with Germany, his record of five for a season from last term looks like it will be gobbled up in no time. Given only his third start of the season, Havertz showed his intent for a larger slice of the action with assists for Leon Bailey, Sven Bender and Julian Brandt in an enterprising outing. Die Werkself went on the rampage at Gladbach, with Havertz – Matchday 9's Man of the Matchday - fuelling their rise up the standings. With his fifth goal of the season, Philipp is emerging as one of the bargain buys last summer – not just for Official Fantasy Bundesliga managers. His strike in Frankfurt was his first on foreign soil too, showing his comfort zone is not just confined to the Signal Iduna Park. Indeed, he looks happy in the opponents' penalty area, period. Converted his second penalty in the Bundesliga and has now scored for the third game in a row, which is a particularly important statistic for his club, since they have never lost in any of the four games this season in which he has scored (three wins, one draw). Get him in your Fantasy team and you too could be on to a winner – when he scores.